A new season is on the horizon. A different pace is required—but it’s not faster. It’s not a grasping of the wind, but a sitting down and soaking it in kind of time. A time to savor. A time to let go of the hurried, fast-paced and frantic way of living. You fear you’ll miss out, but turn your attention towards Me and listen to what I’m saying. Don’t miss out on the gift I am giving you right now. Keep in step with My Spirit so you don’t miss the miracle. Don’t look to the right or the left. Keep your eyes on Me as I reveal the next step. Don’t be afraid to do things differently—to walk forward with an altered gait. Take the next step and move into a sweet wave of My love. It is not altogether familiar but fresh and life-giving. It might look different than what you’ve pictured, but it is a picture, a season, that you will cherish for a lifetime. Kick regret to the curb by opening the door to this new thing. Bend your will, surrender assumptions and dare to trust My leading. As you open your hands to receive, I will deliver a surprise. As you open your mouth to eat, I will fill it with good things. As you open your home to receive, I will bring those who need refuge. As you open your life in faith, I will stretch you for My purposes. 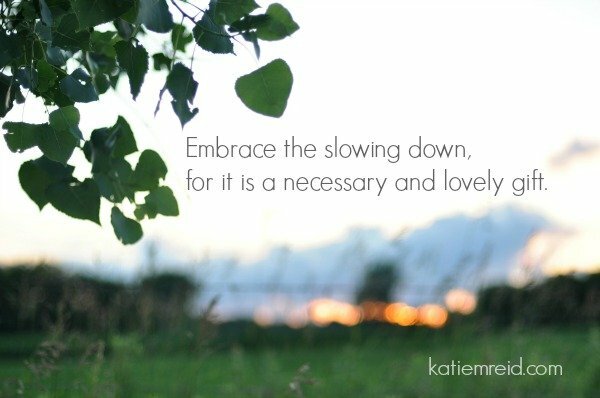 Embrace this slowing down, for it is a necessary and lovely gift. Lean in, listen close, listen well to the new rhythm that I am conducting. There will be missed notes and slips-up but don’t let those mute the Spring Symphony that I am orchestrating. I will use this time to till dead places. I will use this time to restore you in important ways. I will use this time to usher in abundant life and quiet the noise that currently numbs your soul. Don’t fight the slowing down. It is not weak, it is not lesser than, it is just right—for this time. Just like all the others, this new season is tailored-made, carefully crafted and sealed with love—not easy but beautiful. Don’t overlook the details of My affection. Don’t resent this season because it is different than what you prefer. See Me here in the midst and draw near to Me, closer than ever before. P.P.S Linking up with Kelly Balarie’s at Purposeful Faith for the #RaRaLinkup. Aw. This is so touching and heart-warming. Living in the moment and in the season with faith. Hi Lux: Yes, I want to live in the moment and be present and stop all this rushing. Katie – This is such a moving piece. 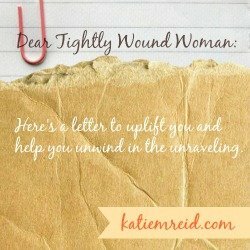 I love all the nuggets of truth here… the one that spoke to my heart this morning was this one: Don’t fight the slowing down. It is not weak, it is not lesser than, it is just right—for this time… I so needed the reminder that it’s ok to slow down and it doesn’t make me weak or less than. Thank you for visiting my blog yesterday. Thank you Debbie and you are welcome. When we are weak He is strong indeed. Katie, I just found you and just today read this post. I have been searching for these particular words for so long now. I have always been the EverReady Bunny and done whatever whenever I wanted to and 3 years ago my life drastically changed in an auto accident and I became disabled. I still want to do what I used to do and my body will not allow it and I get so angry. God has been speaking to me for some time now to “Be still and know that I am God.” and I was not quite sure what He was telling me but your words hit me square between the eyes today. What an eye opener for me. Especially because I have been seeing myself as weak because I could not “DO” everything I wanted to do for myself, my family, my friends and my God. I just pray that I can accept this revelation I have received from God through your words and accept the fact that it is OK to slow down and be still and worship and honor Him in ways that He will show me in my stillness. I have volunteered to lead a group of “Young at heart” senior ladies at our church in a Bible study and have been praying very hard about what to study. Do you have any suggestions?